So now that the American people are finally turning against the occupation of Iraq in huge numbers across both poles of the political landscape, the Green Party, the supposed banner of peace, justice and environmentalism, has settled on a plan of inaction that supports the perpetuation of the war and the corporate contamination of the American political system. That’s the real import of the party’s decision to support David Cobb, the stealth candidate, and his safe state’s presidential strategy. This leaves the Libertarians (a laudable conclave, despite their unyielding fixation with the tax code) as the only genuine anti-war political party in the general election-unless that master GOP fixer James Baker rushes to a distress beacon from the Oval Office and orchestrates an October deus ex machina, not by whacking Iran or Syria, but by cleaning the neo-cons out of the White House, in which case Bush, itching to exit Iraq, may yet emerge as a born-again pacifist rival to Michael Badnarik and the Libs. In any event, the mantle of peacemaker won’t be shouldered by the patrician warrior John Kerry or his stiff proxy David Cobb. The Greens have rendered themselves irrelevant as anything more than a feel-good subaltern to the Democratic Party, a kind of decompression tank for thumb-sucking progressive malcontents. Cobb and his gang say that the safe state’s approach permits them to engage in party-building from the ground up by recruiting fidgety progressive Democrats without scaring them off with the prospect that the party might actually do some damage in the fall elections. Even taken at face value, it’s a silly plan. Why waste time trying to lure Democrats, who long for a return a mystical era (usually represented by FDR or, even more preposterously, JFK) that never really existed? They’ll only flee back to the Democrats with the slightest flurry of rhetorical coaxing. Why not concentrate on the 50 percent of the electorate that has rightly abandoned electoral politics out of boredom, frustration or anger at having no one worth voting for? An argument can be made that the Greens will be better off as a party under Kerry. It goes like this: Kerry deepens the US role in Iraq; he escalates the war on Colombia and acts belligerent toward Venezuela and Cuba; he okays the construction of a natural gas pipeline across the Arctic tundra; he appoints an anti-abortion justice to the Supreme Courtl he imposes the austere economic regime scripted by Robert Rubin; he enacts new trade deals with China and Latin America; the jobless rate soars; social programs are sashed and privatized; social security is handed over to mutual fund managers. Under this plausible scenario, the most likely place progressives could turn for political relief is the Green Party. Naturally, this is not Cobb’s plan. The Cobb scheme must be viewed more cynically-not as a way to grow the party, but slowly smother it from within. The safe state strategy is a recipe for political blowback. The Democrats have taken over the Green Party, just as they did the Labor Party, neutered its agenda and extinguished its only real power-the power to deny Kerry the presidency. To reconfigure Hamlet, this is how to support a war while seeming not to. It’s simply a Green deceit. And the fact is that even in the so-called safe states Cobb is unlikely to get more than a single percent of the vote. No one knows who he is and he’s working hard to keep it that way. Green celebs, such as Medea Benjamin, the boho diva of Global Exchange, were recruited to inveigh against Nader and Camejo. Who knows if Medea swayed any votes. Her home state of California didn’t seem to pay much attention to her shrill alarums, because Peter Camejo won about 75 percent of the vote. Remember, this was Medea’s second swipe at Camejo. Last fall, she also infamously weighed in against the recall of the insufferable Gray Davis, perhaps the worst governor in the history of California, including Reagan and George Deukmejiean. In many state conventions and in the run up to Milwaukee, Cobb’s mercenaries tried to suppress the vote. In several cases, they allowed frothing Democrats to intimidate voters as they tried to enter the convention buildings, while Cobbites continued the harangue on the floor itself. How do you build a grassroots movement, when you spend most of your time driving people away from your party? Ridiculous. Even with all this slimy electioneering, Nader and Camejo still had more than enough actual votes to trounce Cobb and his know-nothing running mate, Pat LaMarche. But this Green junta doesn’t count actual votes. It’s electoral process seems to have been devised by Baby Doc Duvalier, where only the votes that have been pre-determined to count actually count. Knowing that the Green electoral process was irredeemably flawed, Nader was right to reject the Greens early this year when he announced his candidacy. But he was foolish to court their support this summer. The problem for Nader was that the Democrats launched a pre-emptive attack on his campaign, fighting to keep him off the ballot in state after state. The Arizona situation may be the most hypocritical of all. There the Democratic Party hired people to scrutinize every signature seeking to invalidate them on grounds that some had criminal records or had not updated their addresses. Sound familiar? It’s a replay of the Jeb Bush and Katherine Harris plan for Florida. Similar voter suppression campaigns were deployed in other states, including Oregon, Ohio and Pennsylvania. The famous battleground contests. Nader wrongly assumed that the Greens, when faced with the pro-war, pro-corporate campaign of John Kerry, would throw their support behind his anti-war crusade. What Nader didn’t realize-though he should have-was that the leadership of the Green Party had been hi-jacked by Democratic loyalists, many of them allied with non-profit groups getting money from foundations, like that of the Bush-hating billionaire George Soros, with a huge stake in a Kerry victory. So who is this new champion of the Greens, David Cobb? In the 1990s, Cobb, who markets himself as a working class hero, lived in Houston, where he worked as a lawyer for an insurance company, the bane of Nader and most poor people. There, according to a former colleague, Cobb’s duties included finding ways to deny claims to injured parties and sick people. Cobb ran the local Green Party as a tiny autocracy, unilaterally deciding which issues to take a stand on. According to several Houston Greens, Cobb proved to be both politically timid, extremely calculating and heavy-handed. In 1996, Cobb refused to oppose a local referendum on a taxpayer-financed stadium, which ended up only being opposed by libertarians. Cobb told a local Green organizer: “That vote was doomed to lose so we didn’t waste our time on it.” Grassroots organizing? Hardly. This is top-down organizing at its most petty and self-destructive. Another example from Texas. In 2000 during the peak of Bush’s killing spree, a group of anti-death penalty activists got arrested during a protest outside the killing chamber in Huntsville before the execution of Gary Graham. They soon circulated a letter of support through the progressive community. Noam Chomsky and Howard Zinn signed on, as did many local groups and churches. But not the Houston Greens. Not at first, anyway. Cobb objected. According to an anti-death penalty activist, Cobb said he didn’t want the Greens associated with the campaign to save Graham from the lethal needle because “he might be guilty.” What does guilt have to do with moral opposition to the death penalty? What kind of courage does it take to oppose the execution of the innocent? Eventually, more humane hearts in the local Green community over-ruled Cobb and the party finally signed on. But too late to do Gary Graham any good. What about Palestine? Nader recently denounced both Kerry and Bush as being owned by the Israeli lobby in DC. But don’t expect David Cobb to stand up against the rampages of the Sharon government. Buzzanco had a radio show on the local Pacifica station in Houston, KPFT. In 2002, he came under attack from local liberals for his commentaries on the rampages of the Sharon regime, a campaign that finally resulted in Buzzanco being placed under an internal investigation by Pacifica’s thought police. But take comfort. At least he’s not a millionaire … not yet anyway. 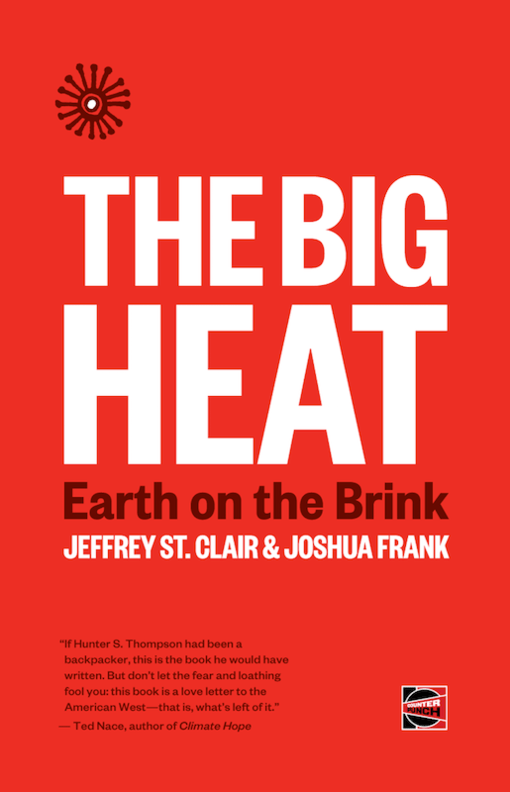 JEFFREY ST. CLAIR is the author of Been Brown So Long It Looked Like Green to Me: the Politics of Nature and, with Alexander Cockburn, Imperial Crusades: Iraq, Afghanistan and Yugoslavia.